Current Status: In Grand Lodge vault; according to the 75-Year History, Page 1987-47, the lodge moved to Needham in September, 1981. On an evening early in the winter of 1911/12 Marshall Livingstone Perrin, a citizen of Wellesley — a famous scholar and a much esteemed educator — unlocked his front door and entered his residence. It was well past midnight; he was tired, tired with that comfortable feeling of tiredness which comes from healthful exercise in the open air, for he had just finished a four-mile walk from a neighboring town. After a day of usual activity in his office he had gone that evening to the Town of Natick for the purpose of attending a meeting of Meridian Lodge, where he had long been a member and of which he was a Past Master. The history of Freemasonry had, for him, been a labor of love and few if any of his contemporaries equalled him in the knowledge of the history and traditions of that Fraternity or in the ability to impart that knowledge to newly-admitted members. The meeting that evening proved to be a long one and he had missed by twenty minutes the last electric car for Wellesley. In 1912 the automobile had not become the ubiquitous vehicle of later years and no one was available to offer him a ride home. He was not alone, however, for he was joined by a friend in whose companionship he delighted, and interesting conversation made the hour pass quickly. As they approached the corner where their paths separated, each heading to his nearby home, his companion said, "Marshall, I am getting to an age when these late hours are becoming somewhat of a hardship. Fond though I am of Meridian Lodge, I should be happy if we had a Lodge nearer home. We have a good many Masons residing in Wellesley, and others are constantly moving into the Town. Would you consider it practicable to have a Lodge here?" Marshall Perrin for some time had had thoughts of his own on the subject, and now needed only the remarks of his friend to convert thoughts into action. Before sleep closed his eyes that night, he had planned a tentative procedure. He had recently been named by the Most Worshipful Grand Master of the Grand Lodge of Masons in Massachusetts to be District Deputy Grand Master for the 23rd Masonic District, a position giving him a certain weight of influence in forwarding this purpose. So many Masons in good standing have replied favorably to my recent letter of February 15 that I am notifying these gentlemen to meet at my home next Monday evening, the 26th, at 8:00, to consider the proposition in some concrete shape. It would give us all pleasure and encouragement if you could be present. The meeting thus called was well attended and the project was supported with enthusiasm. The name Wellesley Lodge was adopted, and a committee consisting of Brothers Perrin, Bancroft, Cutting, Henry, Porter and Wight was appointed to make further arrangements to obtain the sanction of the Grand Lodge and a release from Norfolk Lodge of Needham, under whose jurisdiction the territory comprising Wellesley had recently been placed. It will surprise some of our Brethren to learn that this would not be the first Masonic Lodge to operate in the area now Wellesley. Meridian Lodge, located in Natick since 1852, was chartered in Watertown in 1797. On June 10, 1811, this Lodge voted, with the approval of the Grand Lodge, to change its location to the section of Needham now known as Wellesley Hills, where meetings until 1843 were held in Smith's Tavern, a building on the Boston & Worcester Turnpike erected some years before. This building will be remembered by many of our older Brethren as it was operated later under the name of Elm Park Hotel, the location of which is now marked by a graceful clock tower. Meridian Lodge was for many years the Masonic Home for Wellesley Masons, and properly it has a place in any history of Masonry in Wellesley. As stated before, sometime previous to 1912 the Grand Lodge of Massachusetts in a redistricting of Masonic jurisdictions in the State placed Wellesley under the jurisdiction of Norfolk Lodge, Needham, and from then on, it was Norfolk Lodge which received from Wellesley residents applications to receive degrees in Freemasonry. It seemed probable, therefore, that the new Lodge to be established in Wellesley would draw a considerable part of its membership from both Meridian and Norfolk Lodges. That Meridian Lodge commend and encourage the Brethren at Wellesley in their efforts to organize and establish a Lodge of Free and Accepted Masons in that town and extend to them our hearty support and fraternal good wishes in their ultimate success. Other Lodges also sent messages of approval and encouragement, and the Wellesley group had the satisfaction of knowing that they had the good will and cooperation of their neighbors on all sides. From this point on, winds were fair and skies were blue, and matters proceeded in normal sequence. A petition signed by 36 Wellesley Masons to the Grand Lodge of Massachusetts prayed to receive the right to meet as a Lodge of Masons under dispensation of the Grand Lodge. And May 28, 1912, was fixed by that Body as the date to reply to that petition. That meeting was most impressive and a full account of the proceedings will be appropriate in any complete history of Wellesley Lodge. In this brief sketch, however, it will be sufficient to our purpose to record that the action of the Grand Lodge was entirely favorable. By arrangement with Sincerity Lodge, I.O.O.F., of Wellesley, the meeting was held in their hall located in the Shattuck Block in Wellesley Village. The Grand Master, Most Worshipful Everett C. Benton and his distinguished Suite of Grand Lodge Officers assembled in the hall, from which all others withdrew. The Grand Master then invited the petitioners to enter, and informed them that he was pleased to grant their request. Treasurer: Francis C. Hersey, Jr.
During this ceremony, the Most Worshipful Grand Master presented to Worshipful Frank E. Buxton, Master of Wellesley Lodge under dispensation, a gavel with a most interesting history. It was made by a Mason from timber cut from a cedar log, one of a small importation of such logs made by the Massachusetts Consistory. The logs were brought down from Mount Lebanon by members of Mount Lebanon Lodge of Beirut, Syria. They were prepared for shipment, placed on board ship, transported to New York, thence to Boston, discharged at pier, passed through customs and delivered to the importers, being handled and cared for only by Masons throughout the entire operation, and always without charge, a good example of the universality of Freemasonry. The completed artifact was delivered by the maker to the Grand Master, and was delivered by him to the Worshipful Master of Wellesley Lodge, U.D., who himself was a Past Master of Mount Lebanon Lodge of Boston. Thus was Wellesley Lodge born under the happiest of circumstances. Right Worshipful Marshall L. Perrin — died December 1, 1935. A life-long resident of Wellesley, where he was Superintendent of Schools 1891/1908 — Master of Meridian Lodge of Natick 1897/98 — District Deputy Grand Master for the 23rd District 1912/13. In 1920, as Deputy for the Grand Lodge of Massachusetts, he visited various Masonic Lodges in China and received his 32nd Degree in Gate of Heaven Temple at Peiping. Right Worshipful Frank E. Buxton — died January 11, 1939. Master of Wellesley Lodge, U.D., 1912/13 —Past Master Mount Lebanon Lodge of Boston — Standard Bearer for Grand Lodge of Massachusetts — Treasurer of Wellesley Lodge for many years until his death. Right Worshipful Henry Porter Smith — died January 7, 1935. Holder of many Masonic honors— Master of Wellesley Lodge 1915/16 — District Deputy Grand Master 5th District 1924/25. On May 27, 1913, the process of establishing Wellesley Lodge was brought to consummation. On that evening Most Worshipful Everett C. Benton, with an imposing Suite, again visited Wellesley and presented to Wellesley Lodge its duly-completed Charter, and at the same time, installed as Master Frederick E. Porter, who thus became the first Master to serve under the Charter. Presentation of the Charter was followed by a charge written and used by Grand Master Paul Revere in 1795 and delivered on this occasion by Right Worshipful Thomas W. Davis, Recording Grand Secretary of the Grand Lodge of Massachusetts. After a group of Masons has received from the Grand Lodge authority to function as a Masonic Lodge, it must provide a home for itself and equipment wherewith to work. The friendship and hospitality of Sincerity Lodge of Odd Fellows which, as previously stated, loaned their hall for the meeting of May 27, 1912, enabled Wellesley Lodge to rent from them on an annual basis the use of their quarters in Shattuck Block for seven years, until the summer of 1919. So pleasant were these relations that when that year Sincerity Lodge purchased for their own use the Nehoiden Club Building on Central Street, Wellesley Lodge was glad to continue to be their tenants and to share quarters in their new home. This location, convenient and otherwise adequate and pleasant, had the disadvantage of being so close to the railroad that the passing of trains drowned out all possibility of hearing any sound of the human voice inside the building and made necessary the suspension of proceedings until the train had passed. In view of this feature, a committee was appointed to consider possibilities of other quarters. On March 14, 1922, it made an exhaustive report, recommending the purchase of land on Maugus Avenue and the erection of a building primarily for the needs of the Lodge. The report was approved and the committee was requested to proceed with plans of financing and building. Nothing came of this plan. It doubtless was more than the Lodge could safely undertake, but it is interesting to note that our present quarters into which the Lodge moved in 1955, 33 years later, are within a few hundred yards of the location suggested by the committee. Wellesley Lodge continued to share the premises of Sincerity Lodge until the summer of 1924, when the former moved back to Shattuck Block into greatly improved quarters, and took on a five-year lease with renewal provisions. In addition to repairs and alterations made by the landlord, the sum of about $4000 was contributed by the Brethren to renovate and refurnish the lodge-rooms. This was done under the direction of Brother Robert G. Smith, who devoted to the work much of the summer of 1924 and produced quarters attractively furnished and adequate for the current needs of the Lodge. One feature worthy of mention was the settees, which he secured from an old church about to be demolished. These are massive pieces made from heavy hardwood timber by craftsmen of a past generation, and when refinished and installed, added much to the quality of the room. They are now being used in our present lodge-room. The 113th regular communication, on September 9, 1924, was held in these new quarters. Among those present on- this memorable occasion were Worshipful Frederick E. Porter, first Master of the Lodge under its Charter, and three others who may well be numbered among the fathers of Wellesley Lodge: Right Worshipful Marshall L. Perrin, Right Worshipful Frank E. Buxton, Right Worshipful Henry P. Smith. These new quarters were to be the home of the Lodge for more than 30 years, and when with passing years the growth of the Lodge made it desirable to seek larger quarters, it was not without feelings of regret and nostalgia. Within those walls fellowship prevailed and life-long friendships were made. There veteran members saw their sons become Masons and there, on many, many occasions, the members stood with bowed heads while the Master read the names of departed Brothers. To return to 1912, having secured a home, furnishings were required. This was done in a simple but adequate manner, and many appropriate gifts were received from friends and well-wishers, members and others. An income adequate for the needs of Wellesley Lodge was essential. Immediate needs were provided by contributions of $5.00 each from some 60 charter members. Annual dues were fixed at $5.00, and the fee for conferring degrees, $50. Expenses likewise were moderate, and the Lodge was able from year to year to meet expenses and make contributions to the Charity Fund, now known as the Relief Fund, and to a Permanent Fund, in which the Lodge accumulated a modest capital. In 1944 all amounts paid in for Life Memberships were transferred to a Permanent Life Membership Fund, from which annually the income is transferred to the Lodge for general purposes. In 1948 a Building Fund was established, beginning with a bequest of $500 from the estate of our late Brother Benjamin L. Kartt, and augmented annually by an appropriation by the Lodge of $25 from each initiate. These funds are managed by a Board of Trustees, one of whom is elected annually for three years. The growth of Wellesley Lodge has been fairly steady, as is indicated by the following table, showing membership at the start of the Lodge and at the end of each ten-year period. The rapid growth during the past 15 years has been a source of much satisfaction to the officers of the Lodge, although it has resulted in a great increase in their labors and on occasions, an overcrowding of the lodge-room. In 1953 occurred a fortuitous circumstance which made possible the securing of our present spacious quarters. In the spring of that year the clubhouse of the Maugus Club at Wellesley Hills was destroyed by fire, and in the plans for a new building, Wellesley Lodge was given an opportunity to cooperate to the end that the Lodge would obtain permanent quarters and contribute pro rata to the cost of the building, its investment therein being secured by a second mortgage. The Maugus Club is proceeding with the reconstruction of its quarters and your Committee has arrived at an agreement with the Maugus Club which will include an enlargement of their present plans. This enlargement will provide a space of 3300 square feet for Lodge quarters, anterooms and toilets. It will also provide a space of 1100 square feet for collation room, all under exclusive control of Wellesley Lodge. This will provide better than 50% more space than that which Wellesley Lodge now occupies. In addition to this exclusive use, Wellesley Lodge will be able to use the large banquet hall of the Maugus Club for an agreed upon number of times per year for banquets. It is the unanimous recommendation of your Committee that the Lodge accept this proposition for new quarters. As a special communication on January 20, 1954, the Lodge voted unanimously to accept the plan as outlined. As a vehicle for the carrying out of this plan, it being inexpedient for a Masonic Lodge to own real estate or to assume long-term obligations, a corporation styled The Wellesley Hills Square Associates, Inc., was organized under the laws of Massachusetts. This Corporation; whose members are principally Past Masters of Wellesley Lodge, holds the second mortgage and assumes all obligations to the Maugus Club, the Lodge leasing its quarters from the Corporation. The dedication of the new quarters, which are located at 40 Abbott Road, Wellesley Hills, took place at the 504th regular communication of Wellesley Lodge on March 8, 1955. On that evening a committee, consisting of 20 Past Masters of Wellesley Lodge, received into the new lodge-rooms the Grand Master of the Grand Lodge of Masons in Massachusetts, Most Worshipful Whitfield W. Johnson and his Suite of Officers, who proceeded in a most dignified and impressive manner with the ancient ceremony of dedication. The evening marked another important milestone in the life of Wellesley Lodge and will long be remembered by those in attendance. The new location of the Masonic Apartments in the Maugus Club building has proved most advantageous. Several outside activities have been sponsored, many of which have benefited from the facilities available in the new quarters. The proximity of the large banquet hall has been a distinct asset, especially for our annual "Ladies' Night" parties. The bowling alleys located on the ground floor have inspired us to launch a Wellesley Lodge bowling team. For the past several years our treasury has benefited from the sale of Christmas trees and wreaths. Due to the generosity of Brother William Diehl in supplying the yard space for this event, coupled with the untiring efforts of many Brothers, who frequently have worked in inclement weather, we have additional dollars available for our use. One of the first projects to be accomplished is to improve the ventilation of the lodge-room at a cost of approximately $1000. Such an improvement will not only benefit us, but also the other organizations which participated in the Christmas tree sales. As we acknowledge our gratitude to all the Brethren who have worked for the welfare of the Lodge during the past fifty years, we pray that the blessing of Heaven may rest upon our endeavors and that every moral and social virtue will bind us closer together in our journey towards the hundred-year mark. The rapid growth during the next 15 years had been a source of much satisfaction to the officers of the Lodge although it resulted in a great increase in their labors and on occasions an overcrowding of the Lodge room. The variety of activities included Christmas tree sales, spaghetti dinners and clown shows for children, and Ladies Night parties. The May 8th, 1962, Communication celebrated the 50th Anniversary of the Constitution of Wellesley Lodge. Presiding Master was Worshipful Morton Smith who received the Most Worshipful Laurence E. Eaton, Grand Master and his Suite in a packed Lodge room. The zenith of the Lodge's 75 years came during the 1978-1980 period when Most Worshipful and Reverend Arthur H. Melanson, a Wellesley Lodge Past Master, served as the Grand Master of Masons in Massachusetts. Daily living conditions were changing in America by 1973. Wellesley Lodge was facing difficult times with increased energy costs due to the OPEC oil embargo. Rising real estate taxes became unaffordable. The members could not keep up with the quadrupled operating expenses and building repairs. In 1980 the members voted to terminate their association with the Maugus Club and seek temporary quarters in the Needham Masonic Temple. With the approval of Grand Lodge the move was made in September 1981 with the first meeting being conducted by Worshipful Robert C. Roberge. There were good and bad times for Wellesley Lodge during the 1970's and 1980's. The Lodge continued to initiate members into Masonry. Yet there was a precipitous drop in membership from a high of 603 members during our 50th anniversary year to 303 in 1987. The Lodge finances improved markedly with funds established for future operations. A new plan for the reduction of excess costs was put into effect resulting in a favorable financial condition. On Dec. 29, 1986, Most Worshipful Grand Master Albert T. Ames, an affiliated Past Master, was installed Grand Master of Masons in Massachusetts. Masonically active since his days as a DeMolay, he served Masonry as Senior Grand Warden, Grand Marshal, and Executive Officer of DeMolay in Massachusetts. The winds of change have affected the Masonic fraternity. The popularity of the "village" activity has given way to service and brotherhood on a regional basis. Typically new challenges face the Wellesley Lodge Brothers. They participate in quarterly district blood drives. They attend and work at the Grand Master's annual Country Fair, which has its origin in Most Worshipful Arthur H. Melanson's year as Grand Master. The Shriners Burns Institute in Boston has three of its Board of Governors from Wellesley Lodge. They are Worshipful Frederick A. Spencer, Chairman; Right Worshipful Robert C. Lavin, Vice Chairman; and Right Worshipful Philip M. Turner, Treasurer. Worshipful Brother Spencer is a Past Potentate of Aleppo Temple and Right Worshipful Philip M. Turner is a Past Thrice Potent Master, Lafayette Lodge of Perfection. Brother Richard B Lavin, Aleppo Temple Boss Clown Emeritus, recently served as president of the International Shrine Clown Association. The Lodge continues to attract men of high caliber, doctors, lawyers, engineers, accountants, professionals, businessmen, managers, and craftsmen. Looking ahead to the 100th anniversary of the Lodge in 2012 many of our new members will be the leaders of Masonic bodies. We will be proud to say, "They are our Brothers from Wellesley Lodge." After a year long celebration of the 75th Anniversary of Wellesley Lodge which culminated with a visit from the Grand Master, a member of Wellesley Lodge, Most Worshipful Albert T. Ames and a large suite of Grand Lodge Officers including five Past Grand Masters, one of which was Most Worshipful Arthur H. Melanson, also a member of this lodge and Most Worshipful Whitfield W. Johnson the Senior Past Grand Master. It is now interesting to note that Brother Ames who is with us tonight is the current Senior Past Grand Master. As we entered the next 25 Years leading to this 100th Anniversary we find that Worshipful Brother George I.F. Theriault (who for many years was the Secretary of Wellesley Lodge, and was the brother-in-law to Most Worshipful Arthur H. Melanson, Past Grand Master) serving in 1988 as Master of the Lodge at the age of 80. With the assistance of Past Masters and the other officers, Worshipful Brother Theriault conferred all three degrees on one candidate - an amazing accomplishment at that age (The Candidate later became a District Deputy Grand Master). In 1989 Brother Albert V. Ferguson, later Worshipful Master in 1990, was appointed as Grand Representative for the Grand Lodge of Georgia near Massachusetts. Brother Lincoln K. Richards was selected by M.W. 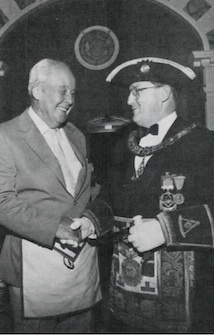 David W. Lovering to serve as Junior Grand Deacon in the Massachusetts Grand Lodge in 1994. In 1996 Brother H. Richard Cornwell became Potentate of Aleppo Temple AAONMS and, from 2002-2003 was Sovereign Prince of the Goddard Council of Princes of Jerusalem. In 2002 R. W. H. Richard Cornwell was appointed Grand Representative to Newfoundland and Labrador near The Grand Lodge of Massachusetts. In 1999 Brother David C. Turner, who later was Master of Wellesley Lodge for the years 2002 and 2003, started his employment at the Masonic Health System (MHS), which eventually became The Overlook Heath Care of which he became its CEO. He earned "Business Leader of the Year for the non-profit Sector" in 2006; was appointed Grand Representative to South Carolina in June of 2000 by Most Worshipful Fred K. Bauer; and was presented the Henry Price Medal in December 2006 by Most Worshipful Jeffery B. Hodgdon. Unfortunately it was also the year that his and Brother James Edgar Turner's father, Right Worshipful Philip Mason Turner, a Mason's Mason, who was active in many, many Masonic bodies and particularly in Wellesley Lodge, unexpectedly passed away. He was a Mentor to an unaccountable number of Masons. In 2001 Wellesley Lodge provided another Brother, Lincoln K. Richards, appointed by Most Worshipful Fred K. Bauer, to serve as District Deputy Grand Master of the Waltham 5th District. He served under Most Worshipful Brothers Bauer and Hicks. He was the sixth selected from Wellesley Lodge by the Grand Lodge in the Lodge's 100 years. The same year, Wellesley Lodge established The Wellesley Lodge Masonic Angel Fund, under the direction of the Masonic Angel Fund Foundation in Orleans, MA, later to be known as the Wellesley Masonic Angel Fund, which now covers "Children in Need" in the three communities of Wellesley, Weston and Wayland. As of the end of the 10th year, 2011, this fund has made payments of over $19,000.00 to assist these children, providing clothing, glasses, tutoring, instruments and lessons, field trips and many other needed items. Donations to the fund have come from many sources including the members of Wellesley Lodge, and especially grants from Gethsemane-DeMolay Commandery #7 in Newtonville, MA, and matching grants from St. Andrew's Lodge in Boston, MA. In 2002 Brother David C. Turner became Worshipful Master of Wellesley Lodge and served for two consecutive years. As CEO of the Overlook Community, which evolved from the previous Masonic Home, he was responsible for many candidates joining Wellesley Lodge and in spite of the distance to the Charlton area, eight of them, including Brother Turner, became Worshipful Masters of the Lodge and covered the ten years from 2002 to 2011. 2003 was the year of the withdrawal of Meridian Lodge, A.F. & A.M., from the Wellesley Masonic Corporation, Inc. The original funds were the result of a Mortgage on the Maugus Club in Wellesley shared by Wellesley Lodge and Maugus Hill Lodge who had merged back into Meridian Lodge in Natick. The appropriate papers were drawn up, executed and final payment was made. Thus ending the sharing of the Wellesley Masonic Corporation funds between the two entities. In 2006 a Wellesley Lodge Scholarship to a deserving Wellesley High School Student who provides exemplary service to the community was established - these presentations have been made annually at Wellesley High School Awards Ceremonies at the High School. In 2011 after six years of providing scholarships to the community; Wellesley Lodge voted to name the Scholarship after Brother Maurice Chapnik who has been the point man on establishing and administrating the scholarships each year. Brother Chapnik was the owner of Lorraine Cleaners in Wellesley Center for many years before he sold the business and retired. During the years he worked at his store he spoke to many about Freemasonry and encouraged many candidates to take the degrees and to join Wellesley Lodge. It was most appropriate that the name of the scholarship became the "Maurice Chapnik Scholarship". In October of 2011 Most Excellent Lincoln K. Richards completed his third year as Grand High Priest of the Grand Royal Arch Chapter of Massachusetts, and Brother George W. Senerth, Jr. was selected by Most Worshipful Richard J. Steward to serve the Grand Lodge of Massachusetts as Senior Grand Deacon of the Grand Lodge. In June of 2011, Right Worshipful Lincoln K. Richards once again picked up the mantle for the fourth time to serve as Worshipful Master of the Lodge thus assuring the success of Wellesley Lodge during its 100th Anniversary Year and celebration. Wellesley Lodge is alive and well and is proud of its long history and June 5, 2012 is a proper time to celebrate 100 years of Wellesley Lodge A.F. & A. M.'s service and steady support to the Grand Lodge of Masons in Massachusetts. In like manner, The Grand Lodge of Massachusetts has shown its reciprocal support to Wellesley Lodge in many ways through the years and especial on this date as indicated by the presence of the Most Worshipful Grand Master, Richard James Stewart, and his suite on this 100th Anniversary celebration. Our thanks to all as the Lodge looks forward to 125 years. Brother Carl Walter Rydberg, left, of Wellesley Lodge, A. F. & A. M., was the recipient of the Joseph Warren Medal which was presented by Most Worshipful Al Ames, Grand Master. The occasion was the Lodge's 75th Anniversary held at the Needham Masonic Temple, Tues., June 2, 1987. Wellesley Lodge was presented with a $6500 donation from its members for the 75th Anniversary Permanent Fund. "Nearly 100 members made the generous donations," said Wor. Vaughn J. McKertich, presiding Master. This page was last modified on 28 January 2019, at 10:08.